On the 11th December 2009 Ruth set off on a 2 month journey which would change her life forever. 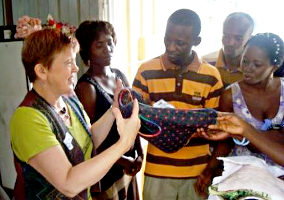 She left with one intention: to instruct teachers, tailors, seamstresses and orphan children in one of Ghana's poorer regions how to sew. She travelled to Mpraeso, which is in the Eastern Region of Ghana 100 miles North West of Accra. With the fantastic generosity of customers in the U.K and Ireland, help from Janome, Superstitch Sewing Machines, Sew... Northampton, CCB Sewing, Sew & So’s and Sewing Machine World, 24 new machines had already been sent the previous month from Dartford via Felixstowe along with 22 suitable donated second hand machines all serviced free of charge by Superstitch in Leigh-On-Sea Essex. And with enough extra equipment to refurbish a sewing academy, second hand clothes, books, toys & gifts galore! Customers had been so very generous. As many of you know, sewing is nothing new for Ruth. Over the years she has taught all across the UK and Ireland, helping many students to develop their hobbies into beautiful, creative results. But, with so much poverty in Ghana, a hobby needs to raise funds to provide for the family. Ruth wanted to help bring this small region into the 21st century by supplying Electric machines to secondary schools. The aim was to instruct seamstresses or tailors in the main towns and maybe even secure a position for some of the older children to take up an apprenticeship with them. The pressure was most definitely on. With so much poverty, very few can afford to have a sewing machine of their own and this is essential if they are to gain an apprenticeship with a seamstress or tailor in the main towns. To be honest, Ruth didn’t know what to expect! Upon arrival it was clear that everything sent in the container from the UK would not be cleared by the agent despite paying visits to all the right people in Accra. Ruth went to all the schools near Mpraeso and gave a day to each sharing as much knowledge as they could take on board. With daily emails and telephone calls to the Clearing Agent in between, she showed them as much as she could on the old hand machines and well used electric ones which they were using, thankful she had packed some samples in her suitcase. Several days were spent introducing herself to seamstresses and tailors in local towns by taking a paint brush, bottle of oil, cleaning cloth and a box of needles (also packed at the last minute) out of her bag and asking or often just pointing at the sewing machines to show them how to set up correctly, re-tension and maintain the machine. Daily emails to the clearing agent didn't help move her machines on any faster though. Ruth was getting anxious. She had promised so many back home that she was going to teach these people a valuable skill. Finally, on Monday 4th January, she went alone to Tema Port with just an interpreter making it very clear, no goods, no money. Finally he was listening to Ruth and although nearly 4 weeks storage had to be paid, by 1pm Tuesday 5th January the truck load was on its 6 hour trek to Mpraeso. On arrival Ruth had the unpacking to do, to sort out the items, test all the machines then start the task of distributing them. She had included several surge protectors, multi-plugs and extension leads in the shipment, circuit breakers and some British Safety Standard fuse plugs. However, some of the schools needed re-wiring with multi-sockets and time was very short. Life for Ghanaians is tough. Their hospitals are pretty basic and it took several bribes to get seen at the weekend by a doctor. It's hard to blame anyone for this ostensible unfairness - out of three x-ray machines, only one was working. How can any system work fairly when demand far outstrips supply? After 2 desperate days trying to receive the right attention in West Africa Ruth admitted defeat and headed for Accra. KLM Airline were happy to take Ruth home immediately providing she signed a disclaimer with a medical Officer at the airport. At 10pm on 11th January 2010 Ruth left Ghana and KLM treated her with the utmost care and attention, taking her from Accra to Heathrow via Amsterdam by wheelchair to arrive at the terminal where her husband Ian was waiting. Arriving in Britain was like a different world. For a start it was bitterly cold, but most importantly the local hospital was staffed and had working x-ray machines. After transferring to a different hospital, Ruth spent several weeks undergoing surgery and recovery. Quotes April 2010 – Despite everything, this experience will not stop Ruth. "It has changed my life forever," she wrote on her Facebook page. "I didn't learn something every day, I learnt something every minute. I have to go back." Ruth now plans to recover and start organizing her next trip. "Next time there's just one condition: no mopeds!" It was a long haul recovering from her accident but Ruth was determined that she was not going to be defeated by a broken neck! A titanium plate skilfully positioned between C3 and C4 and 9 months of physiotherapy and she was off teaching for 3 weeks in Southern Ireland again. 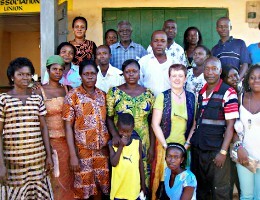 November 2011 Ruth flew back to Ghana ready to complete what she started. There were re-introductions in the first 2 weeks and re-testing and distribution of the machines which had been in storage, this time with the help of her driver, arrangements with the seamstress and tailors groups and then street teaching. Teacher training for the staff and education for the teenagers who came in to school during the Christmas break. There was distribution of clothes, books, toys, school stationary and so much sewing equipment that The Seamstress and Tailors Association in Mpraeso and surrounding areas thought all their Christmas’s had come together! 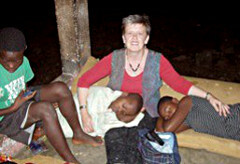 There was a lot achieved in the first 5 weeks of Ruth’s trip but still so very much to do so she extended her visit by a second month and the whole adventure can be shared with you in a 1 hour Ghana Talk. Including the progress that has been made in a newly visited school in Mpraeso Town where she repaired all the broken, stored hand machines. 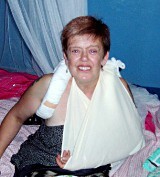 They have now re-opened and extended their Textile department thanks to Ruth and the timing of her accident. 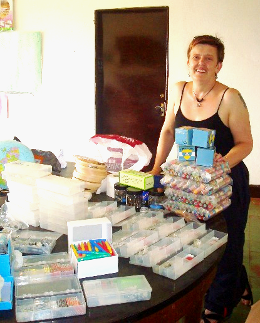 Ruth has heard that Mpraeso Secondary school are making great progress since she left and now have a new working sewing room although have requested more equipment to be able to function more efficiently. Items such as dressmaking books, tailors dummy, irons, boards & hams. 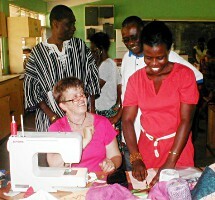 If you are still here then maybe you would like to know that Ruth intends to return to Ghana in February 2014 for about 10 weeks with new sewing machine and Overlockers for the school and teaching centres for adults in Accra as well as second hand machines for the villagers who’d previously missed out. By then some of the students who were at Mpraeso Secondary School could be ready to Graduate. Ruth hopes to have enough machines to set up a sewing area in a Junior school as well as reach out further with hand machines to refugee camps around the Afram Plains. 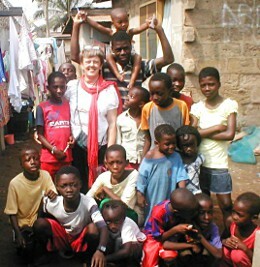 In Ghana it costs as little as 48p for a pair of flip-flops and 55p for a T-shirt for each of these children. 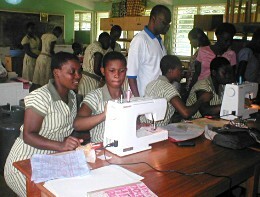 Transport of a second hand-machine and clearance from door to door is about £40-£50 per machine depending on size and weight then approximately £110 to purchase each new Sewing Machine and £135 for an Overlocker that will help educate about 15 new students, male and female each school year. Ruth hopes to fill a container as there are already 21 second hand machines as of March 2013; we have a trusted clearing agent met on the first visit, will pay the duty if necessary which will be quicker, easier and definitely safer than going for NGO clearance. Thank you to everyone for so generously donating the funds to cover the duty on about 60 machines although it would be much better spent on equipment for the schools! Last time customers made and filled small shoulder bags for the street kids and children at the orphanage. This time Ruth is asking you to fill clear empty Chinese take-away boxes with hand & machine needles size 80 to 100, threads, tape measures, seam rippers, chalk, scissors, buttons, hooks, eyes, etc. in fact as much haberdashery as you can squeeze in, then deliver to one of Ruth's Regular Venues as soon as possible and before 30th November 2013.